Titanic lessons in the age of swagger | Words, By George! The sinking of the Titanic is an event that punches even beyond its considerable weight. The loss of any ship on her major voyage with the death of over 1500 people deserves to be remembered. But the sinking of the Titanic continues to fascinate more than does any other shipwreck. The Titanic was a symbol of swagger: the insouciance that flows from self-absorption and an insuperable conviction of invulnerability. It was the biggest passenger ship in the world, setting world records in every statistic. It was proclaimed to be indestructible, armoured against any demons of the sea. It was to take risk out of ship travel. On its maiden voyage it gathered the great and the good of the age who partied on even as the ship was holed. In retrospect the Titanic has become the larger symbol of the end of a swaggering era that was marked by great self-confidence and belief in inevitable progress. Its sinking was the drum roll that welcomed the trenches of Belgium, the beer halls of Munich and the sealed train entering Russia. The dead multiplied exponentially. 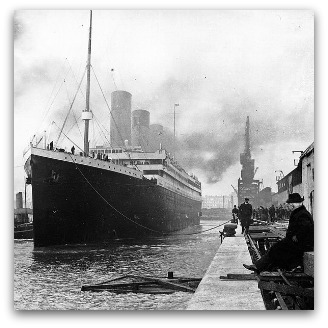 Other historical events have been freighted with the same symbolic loading as the loss of the Titanic. The invasion of Rome by the Visigoths in 408 AD was the climactic event of late antiquity. The Roman Empire made swagger an industry. The choreography of imperial travel, of punishment, of rhetorical celebration, of battle and of history making proclaimed Rome immortal and invincible. The sack of Rome was inconceivable. But the fact that it happened pointed to a long-standing reality that the Empire relied on Barbarian armies for its own defence. When they were double-crossed Rome’s vulnerability became manifest. The stock market plunge on 29 October 1929 is also a symbol for the end of a swaggering age. The self-confidence and the conviction that a speculative bubble could never end were accompanied by a titanic flaunting of wealth and febrile relationships. Although the Great Depression had many subsequent spikes and falls, the plunging of the Dow Jones Index and of speculators from windows are the abiding images of its ending. It brought misery to millions although, unlike the Titanic’s Edward Smith, the captains of industry generally found well-appointed life boats. Then there are minor Titanics: the times when a swaggering organisation suddenly hits a reef. The discovery last year that a Murdoch newspaper had hacked the phone of murdered English schoolgirl Milly Dowland may yet be seen as a Titanic moment for the News print media. Certainly the company has never lacked swagger, displaying an unrivalled self-confidence, an assurance of trustworthiness and the capacity to intimidate critics and politicians. That aura has now dissipated under the constant disclosures of doubtful practices. But the fact that the company’s shares continue to rise suggest that the implosion requisite for a comparison with the Titanic may never eventuate. The lesson of the Titanic is that swagger has its costs. Installing lifeboats for only half of those who travelled on the ship was a gesture of supreme self-confidence but also of supine regulatory failure. It led to an avoidably high loss of life. When we remember the tragedy, those who died should matter more than the ship and its pretensions. Similarly assurance in the making of money that is not guided by an ethical compass is exciting to watch. But in commemorating financial disasters we should focus on the price paid by the poor and unemployed in nations that were despoiled by the profit takers. The story of the Titanic also suggests that when swagger begins to walk the streets it is time to head for the lifeboats. Fascination with the Titanic may imply that we always need to relearn this lesson, and that we find it hard to apply it to the circumstances of our own times. In the world of finance, the churches and the press, mirages of oases surrounded by palm trees always look solid, especially to those who speculate on them. ← Gillard’s Game of Thrones…..